Never Enough Nails: New Polishes from NYC City Samba and Sally Hansen Rio Collections! New Polishes from NYC City Samba and Sally Hansen Rio Collections! Today I have three polishes from the new NYC City Samba and Sally Hansen Rio collections. These collections are really bright and fun for summer. I haven't seen them in my local drugstores yet, but whenever I do, I'll probably pick up a few more colors from both. This lovely peach shade is NYC Sweet Melon. Sweet Melon is a great bright peach creme that has some hidden shimmer. The only time I really saw this shimmer was in direct sunlight, but you can definitely see it in the pictures. Sweet Melon is a bit softer than it looks in these pictures, not quite as bright, but not pastel either. Peach polish can be almost as bad to apply as yellow, but Sweet Melon was pretty good. This is three coats, but it wasn't too streaky and it was pretty pigmented. Depending on the thickness of your coats, you might be fine with two. Again, the bubbles were caused by my top coat. I seriously need to get that thinner, I apologize! For some reason these pictures with the glitter topper make Sweet Melon look like fake cheese sauce, but ignore that. It's a lovely peach! The pretty glitter topper is Sally Hansen Samba, a mix of matte blue and pale yellow-green glitters in a clear base. I love the fact that the glitters are matte, it definitely makes Samba different and eye-catching. Samba needs to be dabbed on, the base is a bit thick. After dabbing some of the glitter on the nail, I moved it around a bit with the brush to even out the coverage. But once you get the hang of dabbing and placing the glitter where you want it, it was OK to apply. Taking pictures of NYC Palm on the Beach really frustrated me. Palm on the Beach is a lovely medium true green, and my camera was just freaking out about it. It kept turning it blue, like completely blue, or making it look almost neon. So I will have to just describe it the best I can for you. Palm on the Beach is a nicely balanced green, not too blue or yellow, just real green. It is lighter than Essie Pretty Edgy, but similar in color. It's bright feeling, but not neon or pastel. My first picture makes it looks too bright and too yellow. The picture below is a bit too blue, but closer. The closest I got is the third picture, with Sally Hansen Samba on top, but my skin is a crazy color LOL. Palm on the Beach was lovely to apply. This is just two coats, it was nicely pigmented and smooth. It's from NYC's fast dry line and it did dry quite quickly. Overall, I love this polish. I just wish it was easier to photograph! It's not that unusual of a color, so I am confused about why it was so hard. And now this one below looks all dusty and more blue again.... WTF camera????? Despite my photography fail, I love all three of these polishes. Sweet Melon is a must if you like peachy melon shades and Palm on the Beach is perfect for green lovers. 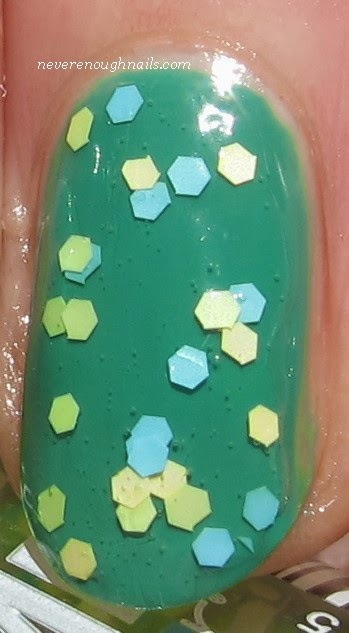 I like Samba a lot too, I think it's a very summery color combo, but it needs a wee bit of patience. The entire NYC City Samba and Sally Hansen Rio collections are available now in drugstores and places like Ulta. The City Samba also has gorgeous lip glosses, bronzers and three shades of nail art polish with ultra thin brush tips. I need to go find these collections in stores soon! I love orange and peach polish, but I know it's not everyone's favorite! That glitter really looks great on top of everything! It somehow makes summer polish looks even more summery. I love how Palm on the Beach looks in these photos. I'll have to check it out to see if I really love it!